MS Rail find applications in city construction projects and other structure-enhancing projects. These are made out of high grade Mild Steel and are highly durable. 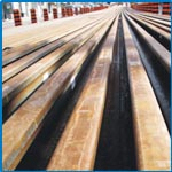 We offer our range in various specifications as per requirements of our clients.